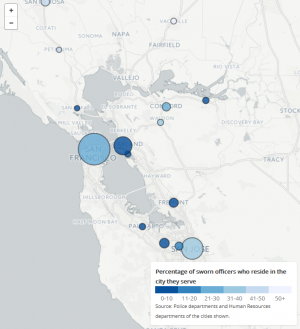 How Many Police Officers in Bay Area Cities Live Where They Work? The deaths of Michael Brown, Eric Garner and Tamir Rice, all unarmed black males killed in 2014 by white police officers, prompted public scrutiny of police departments around the country and sparked deep-seeded racial tensions in many communities. In the wake of these incidents, there's been greater focus on the racial make-up of local police forces, particularly in cities where large minority communities are patrolled by predominately white forces. Less addressed but, some say, as influential a factor in improving police-community relations is officer residency rates. A common argument is that if more sworn officers live in the cities where they work, they'll have a greater stake in the community and be more likely to gain trust among residents. How much impact this actually has, of course, remains up for debate. Within Bay Area police departments, the residency rates of sworn officers varies dramatically. Of the 29 local police departments and human resource offices we contacted, 16 provided us with relevant data; rates among them ranged from a low of 4 percent residency in Antioch to 83 percent in Vacaville. In California, local agencies and districts don't require employees to work in the jurisdictions they live in, and police departments typically cast a much wider recruiting net than the immediate community. Any number of reasons might explain why officers in certain cities don't choose to live there, from housing affordability, to quality of life, to the extent and focus of a police department's recruitment efforts. Each circle in the map below represents one police department, scaled in size to the number of sworn officers in its ranks. As shown in the legend, the circle's shade indicates the percentage of officers who reside in that city; the darker the circle, the smaller the percentage. Click on each circle for the specific breakdown. Note: We also contacted the following greater Bay Area police departments, which have either denied or not yet responded to our requests for police officer residency data. The map will be updated if this data is made available to us. Additionally, police departments in San Leandro, Hayward and Vallejo told us they are in the process of compiling the data but have yet to deliver it.